The director of President Obama’s Council on Physical Fitness and Sports is in Iowa this week, riding RAGBRAI and promoting physical fitness. Shellie Pfohl is a native of Dubuque. This is her fourth time on RAGBRAI. She says the annual bicycle ride across the state is a great example of how everyone should do what they can to stay fit. “RAGBRAI is so awesome because you see 15,000 individuals with different ages and different abililties and some are out there riding a couple miles, some a couple days and some the entire week,” Pfohl said. The RAGBRAI riders, including Pfohl, battled heavy rains today on the trip from Waterloo to Manchester. She says it’s great to see the riders each taking the route at their own pace. “I think it’s so important to say, hey, whatever you can do or wherever you are starting – that’s okay,” Pfohl said. “Just do what you can do to take yourself to that next level.” Pfohl’s promoting a joint initiative with the Iowa Department of Public Health to combat obesity. In Iowa, nearly 39% of adults are considered overweight. Nearly 29% are obese. 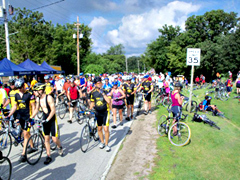 RAGBRAI wraps up on Saturday when the bicycle ride travels from Manchester to Dubuque. Learn more about the fitness plan here:www.idph.state.ia.us/iowansfitforlife.